This is the Official Bujinkan Hombu Dojo felt back patch for 9th Kyu to 1st Kyu levels and is obtained by Bushindo University direct from Soke Hatsumi in Japan. 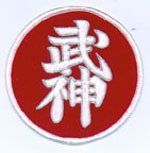 It is exactly as shown in the photo and is worn on your uniform on the left side over the heart. Machine washing not recommended - if you do be sure to use cold water only as it is felt and fades quickly. Many people will add velcro strips to their uniform and the back of the patch so that the patch can be taken off when the uniform is washed. Please note that the price reflect recent price increase from the Hombu Dojo and the changing relationship between the Yen and the Dollar. We offer these official Bujinkan patches as a service to the Bujinkan community. NOTE: IBDA Members can also go into the Membership portal at www.bushindouniversity.com to order there. As qualities get low we only offer these patches to members, until the next shipment comes in from Japan. Thank you for your understanding.